I literally do not have enough good things to say about this team! Erica did my bridal makeup for my wedding, and Joleane and Erica tag-teamed my bridal party and my mom. My mom was very skeptical to get her makeup done, as she usually doesn’t wear makeup, but they did a phenomenal job. My mom loved them, and everyone looked stunning. They were easy to work with, kind, personable, and so so fun! They listened to what everyone wanted, and provided insight as to what works and what doesn’t. I love them, and can not recommend them highly enough!! 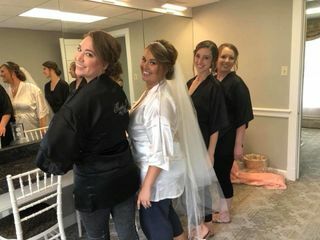 I hired Erica and Joleane for my wedding party's hair and makeup (bride, 3 bridesmaids, 1 groomsman, 2 mothers, 1 grandmother, and 1 step-mother). They were absolutely amazing from start to finish on the day of, as well as during the planning process and my hair and makeup trial. They traveled over an hour to my wedding location on 7/21/18, and even arrived early with coffee for me (that allowed for a stereotypical "the bride" Starbucks instagram photo!). They were both so professional, easy to work with, and just wonderful humans in general. They both worked seamlessly with my other vendors (I had quite a few! ), and helped calm my nerves throughout the morning getting ready. 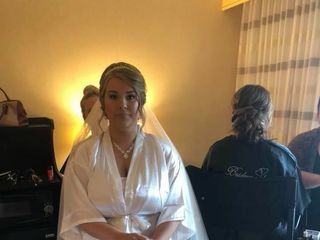 They even made last minute changes to our makeup choices, given the questionable forecast, however all of the precautions we took ensured that it of course did NOT rain on my wedding day! 10/10 would recommend....you need to stop what you are doing right now and book them ASAP for your big day. I felt beautiful and confident walking down the aisle thanks to Beauty Therapy. I can not say enough how good they made me feel... My picture turned out beautiful thanks to their help. I received SO MANY compliments about how gorgeous my hair and makeup was. They are well worth the price... Remember, you will have these photos forever, and you want to feel like a celebrity on your big day. Erica is great with communication. You will have a trial in which you will sit down and figure out your vision for your look. They take the time to do your hair and makeup beforehand so you will get exactly what you want on your special day. They are very experienced, kind, and professional. They helped me fix my eyebrow shape and recommended a stylist to fix my color and cut from a previous mishap with a different unrelated stylist. Their work speaks for itself; look them up on Instagram or Facebook! I cried and my makeup didn't even move... My hair stayed nice all night. We're an unconventional group & my wedding was a costume party. They weren't phased at all! We had a great time & everyone looked, & more importantly, felt amazing! I cannot express how amazing these ladies were on my wedding day. 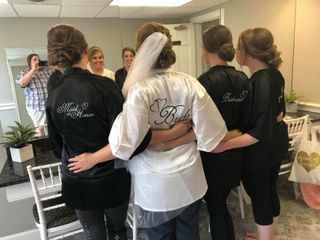 Not only did they make my bridesmaids and I FEEL and LOOK fabulous, but they also helped to keep me calm before I walked down the isle which was very much appreciated. Special shout out to Erica for doing everything in her power to make my day special. 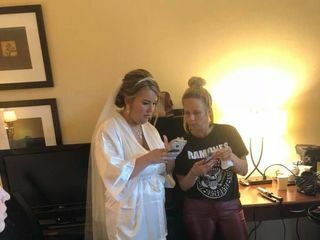 She kept us laughing while we were getting ready, made sure I was hydrated the day of the wedding, had tons of helpful advise, helped me to not have a panic attack before walking down the isle, and made me feel beautiful. She's amazing. Also one more special shout out crystal and Joleane for making our hair look amazing. Especially joleane who showed up with crutches and a newly sprained ankle, you're amazing. Everybody should book this place for their wedding, you will not regret it. Erica is a master at what she does! I am so happy we booked her and her team!! We used Beauty Therapy for hair and makeup services for our wedding. We had 12 people to get done before noon and the BT team made it work! My makeup stayed on all night, and my hair never fell. I was extremely happy with everything!! This team is amazing, I would recommend them to anyone! Erica and Jolene were invaluable during my wedding day! They set a fun atmosphere for us and made sure everyone not only looked beautiful, but felt beautiful as well! I would HIGHLY recommend using them! I am not a big make-up girl and so it scared me to spend that much on something I usually just do myself, but it was SO WORTH IT! Some of the best money I spent!! I wouldn't go ANYWHERE else, and I am a MAC Cosmetics, Dior, and NARS snob!! I felt so beautiful on my wedding day, and the time leading up to, the girls reminded me to hydrate and rest -- they care so much about your big day being as perfect as you want it to be!! My trial lasted almost 3 hours -- it meant so much to me that I wasn't rushed, I was reassured, and listened to. They even took professional photos to remember the exact look I liked of my makeup and hair. Also, they were early (despite the torrential downpour of rain) AND the night before we had a major change in where we were getting ready. I was freaking out that they wouldn't get my email until too late, but they responded immediately. They are truly on their game in every way possible -- latest trends, quality, and performance. Not to mention, they are super awesome gals who I now consider friends :) Beauty Therapy, thank you, you are the best!!!! Erica and Jolene did my hair and makeup and all I can say is...WOW!!!!!!!!! Everything looked perfect the entire wedding and reception for myself. I loved working with Erica & Jolene, and so did everyone in my family/bridal party! They are very skilled at what they do. 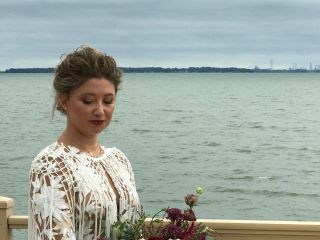 I prefer a natural look for makeup and have hardly ever been happy with professional makeup, but I LOVED what Erica did! She did my makeup so perfectly & beautifully for my wedding day and I still looked like myself. Jolene was wonderful also. My hair was perfect!! Erica & Jolene are also very friendly and flexible, and we loved working with them. Thanks again! They were wonderful, I was very nervous and they eased my nervous by both listening to what I wanted and taking me through every step of what they were doing. I really felt respected and involved in the process. Very professional, accommodating, understanding and reliable. Erica took time to listen to my requests and "tweeked" them perfectly! Erica and Joleane from Beauty Therapy were amazing for my wedding. I knew immediately at my consultation that they were 100% meant to be my stylists for my hair and make up. I originally was only going to have my make up done but after the run threw, I was obsessed with what magic they could work. They are such sweet and kind women that they make you feel so comfortable throughout the entire wedding process. Erica was great in helping me find skin care products that would make my skin perfect for my big day. Not only did they make my bridesmaids and myself gorgeous for my wedding, they also helped me find a last minute photographer since mine canceled last minute. Since Beauty Therapy has so many professional contacts in the wedding world, they were able to find me a photographer within an hour of mine canceling the day of my wedding. Beauty therapy was so amazing that my one of my bridesmaids booked them for her wedding next year as well. My wedding day was perfect with many thanks to Beauty Therapy, I don't think they know how much I truly appreciate them. Beauty Therapy did an amazing job! I felt beautiful on my wedding day and my bridesmaids looked amazing! Beauty Therapy will come to you for your beauty needs which is very convenient. Thank you for making my wedding day extra special. You're the best! I can not say enough positive things about Erica and Joleane. I looked so good on the day of my wedding that I was so upset to have to take my hair and makeup off!! They made the day so much easier by coming to my venue. 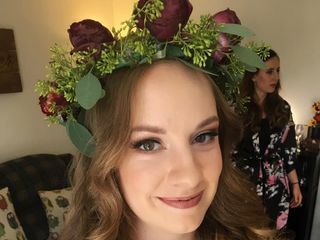 Only 1 of my girls was going to get their makeup done, but once they saw Erica's work every single bridesmaid got it done...and even one who wasn't in the wedding!! They are brilliant with their talent, provide excellence and are FUN!! If you don't use them you for your special day will regret it! I can't say enough good things about Erica and Joleane!! They made you feel relaxed and stress free. Their artistry is amazing. Everyone looked and felt gorgeous!! They listened to to my daughter's ideas and helped her achieve her vision. Much love, gratitude and thanks to these two amazing women! Wanted to take Erica home with me!! I'm the MOB and Beauty Therapy made my daughter's wedding a beautiful memorable event!!!! She made us all feel beautiful!!!! Since I was a bridesmaid in a New Year's Eve wedding last year, I haven't gone anywhere else to get my hair or makeup done. These girls know what they are doing, listen to what you want, and then simply make you look fabulous! I recommend them all the time. They are flexible, professional, and spending time with them will only make you feel prettier on the inside and out when you leave. I love beauty therapy! I can't say enough about Erica and Jolene. They took the ideas I had for hair and makeup and brought them to the next level. They exceeded my expectations, and my bridesmaids were thrilled with their hair and makeup as well. I can honestly say I've never felt as beautiful as I did on my wedding day, and Beauty Therapy was a huge part of that. The fact that they traveled to me, instead of having to go to a salon was a huge bonus. I'd highly recommend them to any bride looking for hair and makeup! I really loved working with Erica and Joleane! All of my bridesmaids loved them, and they did a great job! They were really flexible accomodating our crazy schedule both for trials and the wedding day. I would definitely recommend them to do any wedding or special event. Erica is incredibly talented and my makeup was flawless on my wedding day! She is awesome to work with and makes you feel absolutely beautiful! My makeup stayed ALL day and ALL night and looked as good at midnight as it did @ 9:30 am. I would recommend her services to anyone looking for an amazing makeup artist! I was SO HAPPY with the services I received from Beauty Therapy. I utilized them for my makeup and for my 6 bridesmaids makeup. I definitely had a specific vision in mind going into my consult, and Erica really understood what I was asking for and easily achieved it first try during the practice! 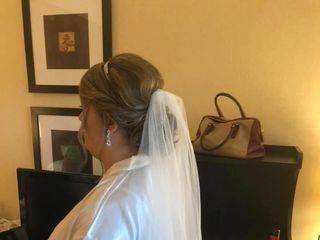 Therefore, I literally had no worries about my makeup going into my wedding day– and it was so nice to know that I didn't have to even think about it– I knew Erica would make me look beautiful. And she did! My skin looked flawless and photo-ready thanks to her. My bridesmaids all looked literally perfect. And Erica is so much fun to be around! It can sometimes be weird having someone in your personal space, putting a bunch of stuff on your face– this is NOT the case with Beauty Therapy! Erica is really natural about it and she made all of us feel very comfortable. This service was definitely worth the cost– and I have the flawless photos to prove it! I highly recommend Beauty Therapy! Beauty Therapy is a fantastic vendor! Erica and Joleane arrived bright and early with so much enthusiasm for my special day. They were fun and genuinely exciting to be around. They styled hair and applied beautiful makeup for 4 bridesmaids, the bride, and mother of the bride quickly but not rushing at all. The ladies were extremely professional and listened to what each girl wanted. They made me feel beautiful from the very first trial. I really appreciated the time they took with each girl to make them all feel confident. They are extremely talented ladies that know how to make you look and feel beautiful for your special day. I guarantee your pictures will turn out amazing and you will not be disappointed with Beauty Therapy. I have and will continue to recommend them!